A space is a top level organization of the Jetspeed site. You can use spaces to organize or group projects or teams into a common area. Spaces can then be navigate to using the Space Navigator. Spaces were introduced in version 2.2.1 as a part of the JetUI feature set. There are two administrative portlets for you to manage your Spaces. The Spaces List and Spaces Manager Detail. The Spaces List shows you a list of all spaces in the system that are visible to the current user. A space is only visible if you have secure access to modify it. Notice that when you are logged on as the administrator, you may actually see spaces owned by other users (see the Owner column). 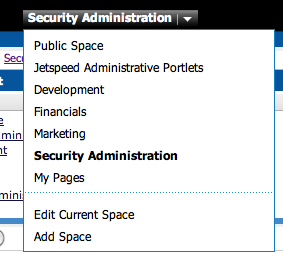 Jetspeed will only allow you to delete spaces where you have the security privilege to delete those spaces. There is a special space, called the Public Space. This is the logical root folder on the system. It can never be deleted. 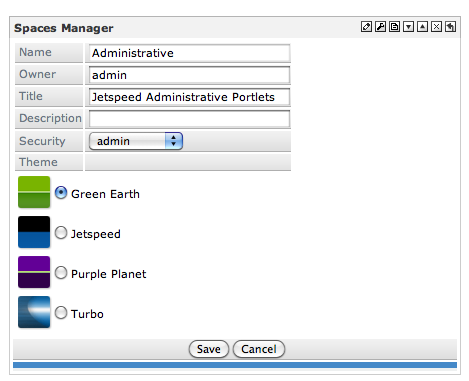 Use the Public Space for setting global settings in the system, like the default theme or default security constraint. Then other spaces can override these defaults settings. All users will also see another special Space called My Pages. It will show up as the last space in your list of folders. This is actually the current users Home Space. Every user has a home space. A drop down list of possible Security Constraints for this space. Please see the Security Constraints guide for more details on setting up secure access to spaces. The Space Navigator is a JetUI special navigational portlet giving users quick access to spaces. From the Space Navigator, you can navigate to any space in the system where you have secure access to view that space. Additionally, from the Space Navigator, the Admin can Edit the current space, as well as create a new space. The Space Navigator is implemented using two new features introduced with JetUI: page templates and detached portlets. In order for the Space Navigator to appear on every page in the system, we have configured it on a page template. See the JetUI Guide and Template guide for more information.